Nobody likes getting pulled over for speeding, but at least when you are pulled over, you know exactly what happened, why, and the cop who pulled you actually knows who you are, regardless of what you’re driving. None of these things can be said about Officer David Carter’s methods, which involved his own private car and tickets in the mail. Officer Carter of the Houston Police Department is under investigation for sending speeding tickets to drivers via registered mail. Carter’s method would involve pacing the speeder in his own private car, then, presumably after using the car’s license plate number to find the registered owner, have a speeding ticket mailed to the listed address on the registration. Of course, there’s all kinds of problems with this. First, pacing the car with another private car just means that yet another car is going, say, 90 MPH in a 60 MPH zone, and that car is not identified as a police car. It doesn’t actually stop the person from speeding, and there’s no confirmation that the speeding driver is actually the same as the registered owner of the car. In short, it has all the problems of speeding cameras, but with the addition of another speeding car on the road and the cost of an actual human being’s salary. One person who received a citation claims he was out of town at the time, and there’s really no way to prove he wasn’t. Because of reasons like this and others, the city’s legal department is dropping all the mailed tickets. Officer Carter is still on salary, but is currently suspended from any police-related duty. 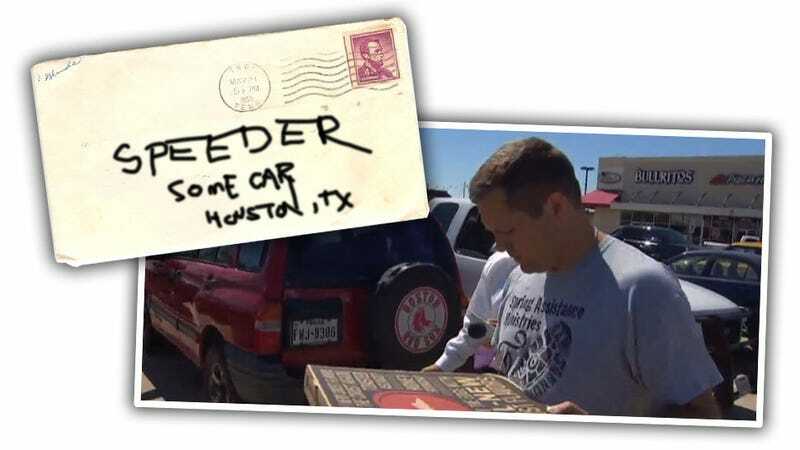 According to an attempted interview on video shot by Dallas TV station KHOU, he is able to still pick up pizzas. I’m puzzled by this, specifically why the officer chose to ticket speeders this way. I mean, if he was at work, why wasn’t he in an actual patrol car? Why did he not want to actually pull the speeders over? Is he just very shy? So little of this makes sense.